To potty or not to potty? Training: Training is the acquisition of knowledge, skills, and competencies as a result of the teaching of vocational or practical skills and knowledge that relate to specific useful competencies. Training has specific goals of improving one’s capability, capacity, and performance. Hello! Who out there is thinking about potty training their little one? Are you dreading it? Or are you looking forward to finally being free from those endless nappy changes? 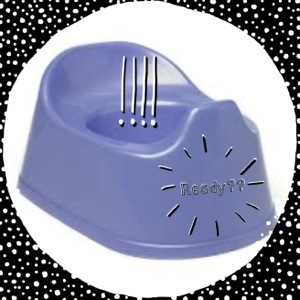 For me, hearing the term ‘potty training’ makes me want to shout out loud to EVERY parent thinking of doing it and say….STOP…it should be called ‘potty when they’re ready!’ They can’t be trained!! And indeed why should they? I have three children, a daughter and two sons, two of which are fully ‘trained.’ (Third is only 10 months, think that’s a bit early!) When my daughter was just two, several of our friends in the local play group were already talking about training their little ones to go to the toilet. Whenever we were out and about together I swear they spent more time in the toilets than actually with anyone else. Every time the words ‘Mummy I need wee’ were uttered off they’d dash, scared of an accident and fearful of the child feeling like they’d failed, that they’d done something wrong by having an accident. The mums all had massive bags too, filled with sweets and chocolate as a reward for success, and about fifty million changes of clothes for those inevitable accidents. They bought books, Gina Ford’s guide to potty training was one, and read them whilst we were out to check they were training their little ones correctly. And I guess there was a kind of peer pressure. If they were all doing it, training their tiny people, then should I be? Did I need to go out and buy a giant sized suitcase so I could carry my daughters entire wardrobe around with me in case she had an accident? Did I need a portable potty so that she could feel free to go whenever and wherever she liked? It all seemed like an awful lot of hassle. Whilst they were all running to and from the bathroom and changing their children, wiping away the tears, I was playing with my daughter. Enjoying time with her, be it at the park or a friends house or indeed wherever we were. She wasn’t showing any interest in using a potty, and she was only just two. I kept thinking to myself, how many grown ups aren’t potty trained? How many children go to school still in nappies? (In my 13 years teaching experience I’ve only ever known of one) And I made the decision then to trust my instincts, I knew she wasn’t ready and I’d be damned if I was going to force her to do something that could potentially cause her more upset than good. So, we waited. And waited. And 6 months later I spied her in the bathroom, sat on one of our potties (yes I had bought some just in case she was ready!) and her favourite teddy bear was sat on another. And they were having a lovely little chat together. She didn’t actually do a wee that time, but not long afterwards she did. And barely ever had an accident. I hadn’t need to train her, I’d waited until she was ready and she had done it all by herself. She knew when she needed to go. And go she did. There were no giant bags of spare clothes, no dashing off and spending hours in public toilets. It was easy. There was no stress involved at all! Nighttime dryness was the same. As soon as her nappies had been dry for a week or so I took them off. And left a potty in the room if she needed it. Which she did occasionally. But we never had a nighttime accident. Because when those nappies had finally been removed, her body and her brain were ready for it. They’d made the connection. They knew when it was time to go, and could wait when it wasn’t. It was a similar story with my 3 year old son. Yet for him to be ready we had to wait until he was three and a half. He would happily sit on the potty, and enjoyed watching his Gruffalo do ‘wees’ on the potty (Which was actually me sneakily pouring water in whilst he wasn’t looking!) But his body wasn’t ready for him to do it himself for a long time later. And whilst everyone else at pre-school ditched the nappies, my little boy remained in his. It didn’t bother him. It didn’t bother me. I knew he’d get there in the end. When he was ready. And he did. At night time too. And we’ve had just one accident. So I guess what I am trying to say with all of these lovely potty anecdotes, is that in my opinion children shouldn’t be trained. Their bodies are complex little things and only when the connections are made in their brains are they ready to use the toilet. It happens at different times for each different child. It’s such an easier and happier experience for everyone involved if you have the courage to wait until they are ready. To not feel the pressure of everyone else waffling on about how their child was trained at 6 months. (Bet these were the children that slept through the night from 6 weeks as well!) Take your time, they all get there in the end. 16 Comments on To potty or not to potty? Thank you!!! I’m feeling the pressure at the moment, but every time i ask the toddler if he’d like to sit on the potty before his bath (i know he usually needs to wee then) he says no. I might wait longer. People keep warning me i might be missing The Window – but as you say, everyone gets there eventually. Hi, stopping by from the Weekend Blog Hop! I agree with your principle of instinctive parenting. That’s what I always follow, not any book or expert. I’m trying my hand at potty ‘training’ at 19 months, but we’re doing it just for fun with no rewards or reprimands. It’s been weeks and he hasn’t peed in it so far, but he’s okay with sitting on it, so there’s some success!